2Whisk together the flour, brown sugar, baking soda, spices and salt; set aside. Grate two of the pears (don't bother peeling them) onto a plate; core and dice the third. 3In a large bowl, whisk the oil, sugar, eggs and vanilla; add the dry ingredients and the grated pears (along with any juices that have collected on the plate) and stir until the batter is almost combined. Add the chunked pear and the chopped nuts, if you're using them, and stir just until blended. 4Scrape the batter into a well greased bundt pan and bake for an hour, or until deep golden, domed on top and springy to the touch. Let cool for a few minutes before inverting onto a plate or wire rack to cool. 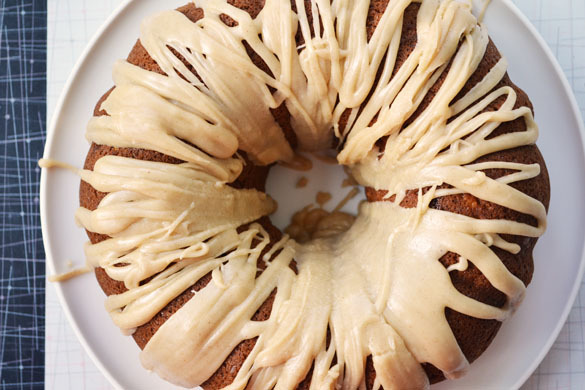 Drizzle with browned butter dribble, if you like. 5Browned Butter Dribble: melt 1/4 cup butter in a small saucepan; continue cooking it, swirling the pan occasionally, until it turns nutty and golden. Remove from the heat and whisk in 1 1/2 cups of icing sugar and 1 Tbsp. hot water, plus a little more if you need it to achieve a drizzling consistency. 6Makes 1 cake; serves 16.